I am having some issues with defining relationships between models and having them save correctly. I can't get anything more complicated than a ...->HasOne(...) relationship to work. A user is logged in and wants to create a new role. We give the role a title and hit 'submit'. Upon submittion, I need to inser this new role into the data base and automatically add the current user to the role. 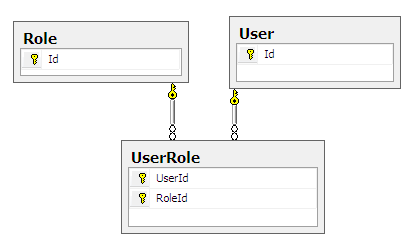 I am not sure what relationships I need to define in my models (User/UserRole/Role) and how I would go about actually inserting items into the data base etc. And that just isn't working. I am just a little lost and was wondering if someone can point me in the right direction! I think you don't need the UserRole->belongsTo functions from what I've read, only in User and Role (I didn't give a try yet). Tried it but that doesn't work. When I 'create()' the role, the UserRole object isn't inserted into the table, even though I pushed it into the Role's UserRole array. Also, the documentation has a lot of auto-magic stuff on foreign keys that I just can't seem to get working. I mean sure, it is easy for me the manually insert a UserRole object every time I want to add a user to a role, but it would be so much better if I could just retreive that user from the database, add a UserRole to their UserRole array and then 'save()' that user and have the changes apply to the database. Even better, it would be awesome if I could eventually do something like $role->Users and have the framework automatically return me an array of users by checking the UserRole table to see which users are a part of the role. I don't know if Phalcon has that sort of functionality 'built in' to its database/module classes, but I think that it would because it would be pretty pointless to define all these relationships otherwise. I believe that your UsersRoles table needs a PK. At least that is how I have seen all the documentation on it. Defining tables and column names with capitals is a quick recipe for diaster. I highly reccomend not doing this. Thanks so much for this! That image was the first example I could find online, my tables and column names do not contain capitals! :) I didn't end up needing a PK for the 'UserRoles' table.